Preventative dental care is something we strive to promote at every examination your pet has here at the Omemee Veterinary Hospital. Over the last year we have been focusing more on getting our early stage periodontal disease pets in for Professional Dental Cleaning Assessments. During Stage 1 to 2 Periodontal Disease we see changes like some reddening of gums along the teeth (gingivitis) and mild plaque and tartar build up (the brown gunk on your pets teeth). During these stages, the issues are completely reversible with a full cleaning of the teeth. In Stage 3 and 4 Periodontal Disease, that’s where things get worse. You will notice severe gingivitis, severe plaque and tartar and also may notice mobile teeth or even teeth already missing. Oh, don’t forget the really bad breath! The issues associated with the later stages of Periodontal Disease are much more difficult to reverse. These stages are also known to be linked to issues concerning heart disease, kidney failure and diabetes. 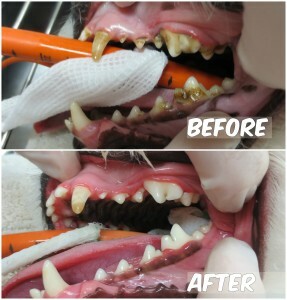 A professional cleaning is even more recommended at this time, as these stages of periodontal disease can be very painful to your pets. During the month of November, the Omemee Veterinary Hospital is offering a 15% discount off of the Professional Dental Cleaning Assessments. The Assessment includes : preanesthetic bloodwork, scaling, polishing, and applying fluoride to teeth, full mouth x-rays and a full oral examination done by Dr. Norman. All of this is done under general anesthetic, which is also included. If there were any extractions or other oral surgery needed to be done, that would be in addition to the cost of the assessment along with the additional anesthesia. If you would like any more information regarding our Professional Dental Cleaning Assessment please contact us at 705-799-5228. November is booking up quickly! Here is a great example of a preventative Professional Dental Cleaning Assessment! No extractions needed.